Timber and concrete lend a somewhat rustic, but sophisticated feel to the building’s main entrance, one that complements the meticulous landscaping. 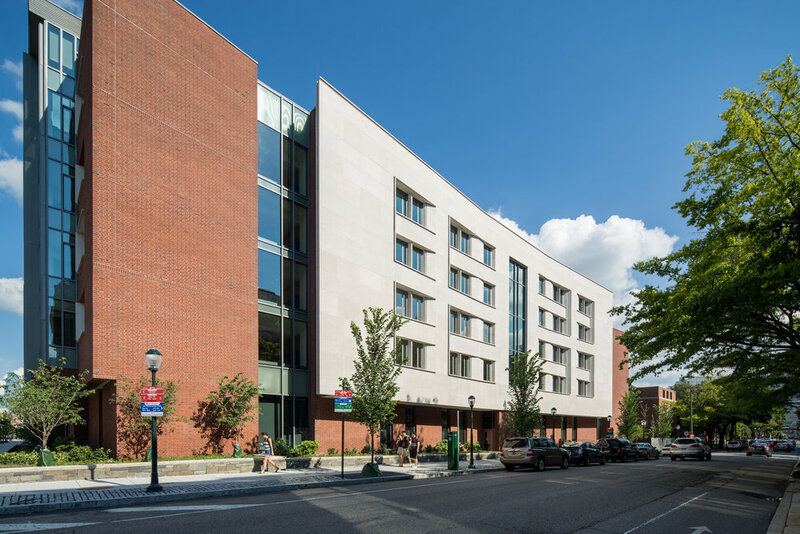 The University of Pennsylvania’s alumni magazine, Pennsylvania Gazette, often engages Greg’s services to document significant spaces and places on Penn’s ever-changing campus. “New College House” was one of the most significant. The first new residence built on campus since the 1970s, it houses over 300 students, faculty and house masters, and includes dining facilities and wide-ranging social spaces. Façades of patterned brick seem to change with the shifting sun; tall glass enclosed areas indicate shared social spaces. Each view offered a different perspective on the building and its surroundings. The view along 34th Street is stately serenity. The publicly accessible “lifted lawn” rises up to offer an open invitation to all. On the morning of the shoot, Greg made his way around the residence and discovered that each view offered a different perspective on the building and its surroundings. He was determined to capture this quality and further illustrate how the building’s design, with its redbrick exterior, limestone trim and tiered glass stairwells, served as an inviting gateway to the greater campus just beyond.